Visit Smith Island, MD. How to get there, things to see. Smith Island is located in the Chesapeake Bay, about 12 miles off the shore of Crisfield, Maryland, where boats ferry visitors, residents, mail, and supplies back and forth from the island daily. There is only one way to get to Smith Island – by boat. There are no bridges to the island and there is no air strip on the island. There are, however, plenty of boats that make the trip daily and will be happy to take you along. Cruise to Smith Island from Crisfield with Capt. Thomas on the Chelsea Lane Tyler, a comfortable twin hull boat with an enclosed area on the lower deck and a sun deck on the upper level. This boat leaves daily from Somers Cove Marina at 12:30 from Memorial Day weekend to mid October. Reservations are required. Tickets are picked up at the Captain Tyler Motel in Crisfield. More Information. You will find other options located at the Crisfield City Dock. The Island Belle and the Captain Jason take passengers to Ewell. The Captain Jason II stops in both Ewell and Tylerton. Each of the boats leave the City Dock in Crisfield at 12:30pm and 5:00pm and leave Ewell at 4:00pm and 5:00pm and Tylerton at 7:00am and 3:30pm. More Information. You can also ride your own boat out to the island. There are a few slips at Smith Island Marina, which is located next to the Bayside Restaurant, where the ferries dock. The “Spirit of the Chesapeake” departs from the Chesapeake Bay Camp Resort in Reedville, Virginia at 10:00am and returns at 4:30pm. Runs from May to October. Reservations are required. More Information. Smith Island is Maryland’s only inhabited Chesapeake Bay Island that is unattached to the mainland by bridge or causeway (Tangier Island, located nearby and to the south, is located in Virginia). The island was first mapped by Captain John Smith in 1608. The island is named for Henry Smith of Jamestown, who was granted 1,000 acres there in 1679. There are a little over 200 year around residents living on Smith Island. Smith Island is actually a collection of small islands, most of which are not inhabited. There are three distinct communities on Smith; Ewell, Tylerton, and Rhodes Point. Ewell is the largest, and is where the tourist boats bring visitors and the mail boat brings supplies. Ewell is also where the visitor center and the island’s three restaurants are located. You can get to Rhodes Point by land from Ewell, but you have to get to Tylerton by boat. Rhodes Point is the island’s boat repair center and the location of the island’s marine railway, where boats can be lifted out of the water for repairs. The Smith Island way of life is tied to the Chesapeake Bay, where resident watermen harvest fresh seafood, mostly in the form of crabs, clams, and oysters. Over 4,000 acres of marshland on the island are managed as the Martin National Wildlife Refuge. Smith Island is small and readily walkable, but golf carts seem to be the preferred mode of transportation for visitors and residents alike. You can rent a golf cart from the Bayside Inn. You will find the carts and bicycles available for rent around the back of the restaurant. The passenger boats will let you off in Ewell, right next to the Bayside Inn restaurant. They offer a family-style luncheon, or you can order from the menu. They make a delicious crab cake sandwich. They also have Smith Island Cakes by the slice, or you can order a whole cake to take with you. Other dining options include getting take out at the Bayside Inn Carry Out shop to the rear of the restaurant (you can sit on a bench on the dock and watch the boats unloading), or the Deck at Rukes General Store where crab cakes, soft shell crabs, and more are served on a screened porch. Rukes is located across the street from the Smith Island Center. The Smith Island Center is a must see for anyone visiting the island. Make this visitor center your first stop before exploring the rest of the island. You can pick up a walking tour map here to guide your island exploration. Be sure to take the time to sit and watch the short film that they show on the television screen just inside the front door. The film is very well done and offers a good view of what life is really like on Smith Island. The visitor center has a very nice display of Smith Island historical items, many on loan from Smith Island families. The museum collection includes information about the history of the island, crabbing items (including a boat), skipjack models, displays about the role of women on the island, and many interesting things about life on the island. Everything is laid out in very nice, professional quality museum displays. The benches on the large porch that surrounds the visitor center are a good place to relax. Bayside Gifts is located between the Bayside Inn and the Smith Island Center. They have a large and varied selection of souvenirs, including a nice selection of local cookbooks. You will find a few other small shops selling antiques and souvenirs as you explore the streets of Ewell. In Tylerton, you can see the ladies of the Smith Island Crabmeat Co-Op picking crabs and packing crabmeat. You can watch them working through an observation window, or for a small fee come into the picking area, ask questions and get a sample of crab meat. They sell crabmeat, crab cakes, crab salad, etc. You should call ahead to make sure they’ll have what you’re looking for available. More information. You will find that you can see the museum and island with plenty of time to spare before it’s time for your ferry to depart. Pick up a slice of cake or some ice cream at the Bayside Inn Carry Out shop or Rukes and sit on a porch and relax. Bayside Inn has a large porch in front, with chairs, and the visitor center is wrapped with a porch with shady benches. Sit back and enjoy the quiet in a place that is truly away from it all. Kayakers will enjoy the winding waterways around Smith Island. The Captain Jason and Captain Jason II will carry your kayak to the island for a small fee. A Smith Island Water Trails Paddling Guide has been published and the waterproof guide is available at island shops, or you can view it online. It is recommended that paddlers keep to the marked water trails, as unmarked areas may be shallow and cause you to get stuck. Be sure to wear sunscreen and bring some bug spray. The island winds often keep the bugs away, but there are some biting flies around. The Bayside Inn is a large, fairly modern, restaurant located right at the dock where the passenger ferries arrive in Ewell. They offer a family-style luncheon for groups and individuals or you can order off the menu. They also have Smith Island cake. The Bayside Inn Carry Out and Ice Cream Shop is located on the back side of the restaurant. You can get take-out meals from here, including crab cake sandwiches. You can also get hand scooped ice cream, snow cones, or slices of Smith Island cake. There are a couple benches on the dock where you can enjoy your meal or treat. 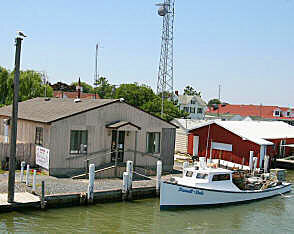 Ruke’s Store and Seafood Deck is located a few hundred feet from the ferry dock, across the street from the Smith Island Visitors Center in Ewell. They offer crab cakes, soft crabs and more on a screened in deck. Here’s a good article about a visit to Ruke’s. Drum Point Market is located in Tylerton. They have crab cakes and subs. They also carry groceries and convenience store items. This cake, made by the ladies of Smith Island for years, has been know to as a special treat to residents of the Eastern Shore for some time. 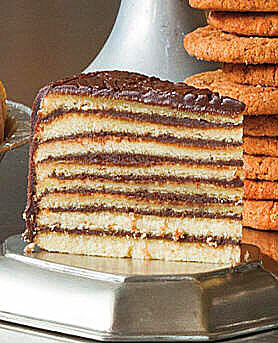 Now, Maryland has named the Smith Island cake as the official state dessert, giving the sweet treat statewide and even national recognition. Smith Island cakes pack 10 layers of cake and icing into a cake that is only about 3 inches tall. The result is a sweet treat unlike anything you will find anywhere else. See more information about Smith Island Cakes. Chesapeake Fishing Adventures. A hunting and fishing lodge located in Tylerton. A variety of fishing, hunting, and lodging packages are available. Chesapeake Sunrise B&B. Located next to the Smith Island Marina. Breakfast included. Fishermen’s Rest Cottage. Rental house in Ewell. Sleeps seven. Pier for small boats. Has kayaks for rent and bicycles you can use. Pauline’s House. Waterfront cottage for rent in Tylerton. 4 bedrooms, 2 baths and an equipped kitchen. Smith Island Inn. A quaint B&B on historical Smith Island offering private suites with full baths, full gourmet breakfast, canoes, bicycles, birdwatching, and beautiful sunsets. Weekend Smith Island Cake demonstrations. Families, singles, and couples welcome. Susan’s on Smith Island Bed & Breakfast. A two bedroom rental with beautiful views of the Chesapeake Bay. Enjoy a home cooked breakfast on the front porch. Smith Island Article from Shore Life Magazine. Nice article about a visit to the island.